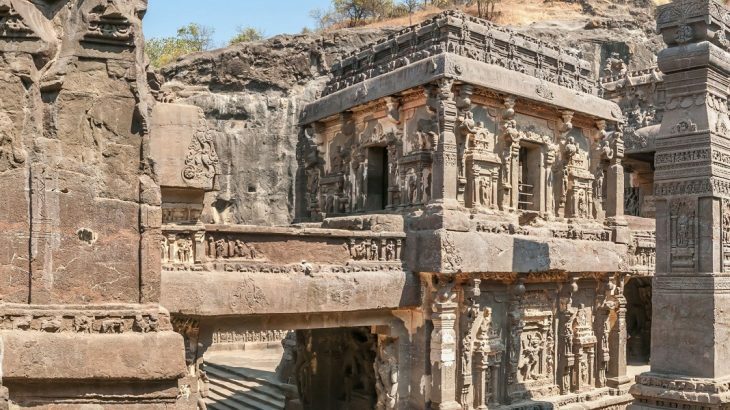 The Kailasa Temple or Cave 16 is one of the 34 cave temples and monasteries collectively known as the Ellora Caves, one among the most visited tourist destinations in Maharashtra. A megalith carved out of a single rock, it is considered as one of largest single monolithic excavation in the world and among the most remarkable cave temples in India. Apart from its impressive size, the temple is also remarkable for its sculptures, as well as for the fine workmanship of its other architectural elements. If you are a history buff and want to know more about this temple then go through our list of some interesting facts about Kailasa Temple of Ellora here. Locally known as ‘Verul Leni’, Ellora Caves are well-known for its largest single monolithic excavation in the world, the great Kailasa Temple. The Great Kailasa is a freestanding, multi-storied temple complex dedicated to Lord Shiva. The specialty of this 1300 year’s old architectural marvel is that it is carved out of a single volcanic basaltic rock of the Charanandri hills and is considered as the largest monolithic piece of art in India as well as in the world. Even the sculptures at this enigmatic temple are carved from the same piece of rock as the rest of the temple. The temple architecture shows traces of Pallava and Chalukya styles. Attracting huge number of tourists across the globe from centuries, it is one of the must visit places in Ellora during your Aurangabad Tour. The architecture of Kailasa Temple is notable for its vertical excavation, the work started at the top and moved downwards, rolling down the large boulders split from the mountain using steel rod drills. One can see the drill marks on the surrounding walls that are still visible. A megalith carved out of a single rock, the Kailasa Temple is the only structure in the world that is craved from the top to bottom. Every single design and measurement was planned very accurately as once its cut there was no chance to change it by adding any extra stone or piece of rock. Legend has it that nearly 200,000 tonnes of rock was removed to construct this monolithic structure. Constructed by Rashtrakuta king Krishna I in 756-773 CE, the Kailasa Temple, prominent of all the Caves in Ellora, has fascinated researchers and tourists for centuries. The archaeologists had calculated that it would have taken more than a hundred years to finish the temple construction. But, in reality it took only 18 years to complete it. The rock cut temple was cut in U shape about 50 metres in the back, and about 2, 00,000 tonnes of rock was scooped out of a vertical basalt cliff in the Charanandri Hills to form the magnificent temple. Everyone is trying to understand how the temple was built, cut out of the rocks, by using ancient traditional methods without using any modern technology with in that short period of time. Dedicated to Lord Shiva, the architecture of the temple resembles the sacred Mount Kailash, the mystical abode of the presiding deity. There are two inner courtyards flanking the entry passage and each has a gigantic monolithic elephant along with 15 m tall victory pillars. There is an image of sacred bull, Nandi, facing the Shivalinga. The Nandi mandapa and main Shiva temple are 7 m tall and built over two floors. The base level gives an effect as if elephants are holding the entire structure. Originally, this structure was coated in a thick layer of white plaster so that it appeared to be covered with snow like the sacred mountain Kailash and some traces of this plaster remain today. Kailash Temple is considered as one of the most remarkable cave temples in India due to its massive size, architecture and sculptural treatment. About 145 feet wide, 195 feet long and 90 feet high, Kailash Temple covers an area twice the size of the Parthenon in Athens, Greece. With its gigantic sculpted monolithic main shrine in the center, gopura and enclosure walls on both sides, the Kailash temple is one of the largest structures in India and in the world, rivaling even the Taj Mahal in Agra. Almost every inch of the interior structure contains intricate sculptures and carvings in Ellora Caves which display artistic richness and philosophy making the caves a major achievement of ancient Indian civilization. Among the most noteworthy are monolithic elephants & victory pillars at the entrance, the image of Nandi, four sculptures of lions standing in a circle on the roof of Mahamantapa, elephant sculptures at the base of the temple, which gives the viewer an impression that the whole structure is being supported on the backs of these beasts. Furthermore, various intricately carved panels can be found in the Kailasa Temple like scenes from the two major Hindu epics, the Mahabharata and the Ramayana along with 10 panels depicting the different avatars of the Hindu god Vishnu. The noteworthy of them is of demon king Ravana attempting to lift Mount Kailasa. There is an interesting tale about the Kailasa Temple of Ellora. Mughal King Aurangzeb who destroyed thousands of Hindu temple, also tried to destroy Kailasa temple. It is said that 1000 people were sent to destroy the temple in the year 1682. They worked for 3 years but they could break and disfigure a few statues only. Aurangzeb finally gave up on this task and realizing that it was impossible to completely destroy the temple as the rock was simply too hard to demolish, even though artisans used only hammers, chisels and picks to construct it. All, Destinations Ellora Cave Temples, Ellora Caves, Kailasa Temple, Kailash Temple, Kailash Temple of Ellora. permalink.